Welcome to the WAND blog. WAND is the world's leading provider of taxonomies. We have taxonomies for every industry vertical segment, business functional area, and extensive taxonomies for ecommerce and product data. This blog will discuss taxonomies, ways to use taxonomy, enterprise search, tagging, ecommerce taxonomies, SharePoint taxonomy, and more. Apple announced the release of the latest Mac operating system today - Mavericks. usually, this news would not cause a ripple in the taxonomy world but one new feature that the operating system includes is Tags. Apple has switched to a tag based approach to help users organize and find documents on their computer. This marks one of the first formal endorsements of a tagging and taxonomy approach to organizing information as opposed to nested folder structures. Consumers will likely come up with their own tags organically as they save files. However, creating an enterprise Taxonomy is a way for an organization to bring a common language and a common vocabulary to employees so that everybody is tagging with a normalized set of terms. Taxonomy and tagging has been the future for organizing information; today's announcement from Apple is a clear sign that taxonomy and tagging is finally coming into its own. WAND Non-Profit Taxonomy Just Released! I am excited to announce that WAND has developed a taxonomy exclusively for non-profits. The WAND Non-Profit Taxonomy was created for any non-profit organization so they may better organize and find their content and documents. The top level terms include Board of Directors, Budgeting and Financial Management, Bylaws and Policies, Compliance, Donations, Fundraising, Grants, Members, Programs, Public Relations, and Volunteers. The taxonomy covers all of the major concepts, policies, processes and documents that a not-for-profit organization would encounter. 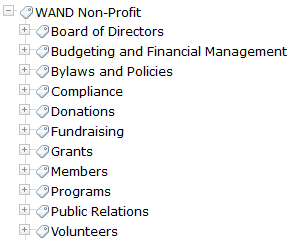 There are 565 categories in the WAND Non-Profit Taxonomy and 258 synonyms. 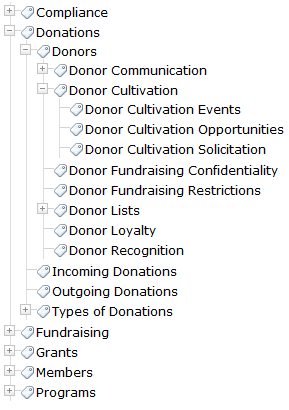 The WAND Non-Profit Taxonomy provides a foundation set of terminology so a non-profit organization can immediately begin tagging their documents with relevant metadata. The taxonomy can be customized to meet the needs of the organization with terminology specific to their programs.